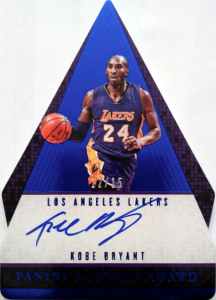 The season may officially be over but more NBA products are still rolling out, including 2016-17 Panini Preferred Basketball. Only about the hits, Preferred is filled with just autographs and memorabilia booklets. Matching the 2015-16 set, collectors can count of two of each in every hobby box. 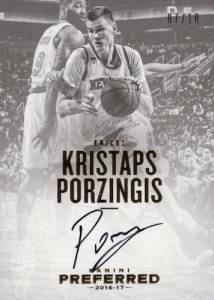 Technically the base set, the 2016-17 Panini Preferred Basketball checklist consists of multiple signed inserts, each with a distinct look and on-card signatures. Falling two per box, this includes intricately die-cut Crown Royale Autographs, triangular Panini's Choice Autographs and the popular Silhouettes Autograph Relics for current stars, past greats and future talent. The Silhouettes insert line also has low-numbered Prime versions. Among the signers of note, Hall of Famer Reggie Miller has his first pack-pulled NBA autographs in over a decade. The other half of the equation in 2016-17 Panini Preferred Basketball is the various memorabilia book cards. Also dropping two per box, the options include horizontal booklets, vertical booklets and even tri-fold editions. 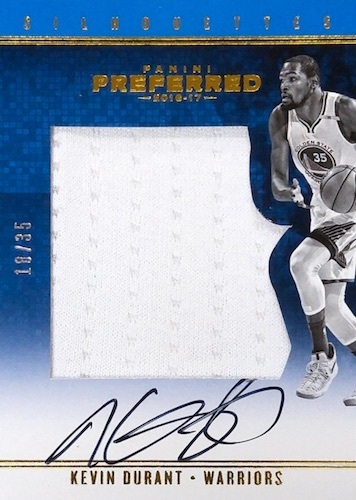 Standouts include the NBA Finals 2016 book cards that logically deal with gear worn in the championship matchup between the Cavs and the Warriors. In addition, Rookie Playbooks opts for the first-year players while VS One-on-One takes a matchup-style approach with two different player relics on one large booklet. Other book sets include Crazy Eights, Stat Line and Trending Upward. Most of the 2016-17 Panini Preferred Basketball booklet cards include base, Prime and Super Prime versions. 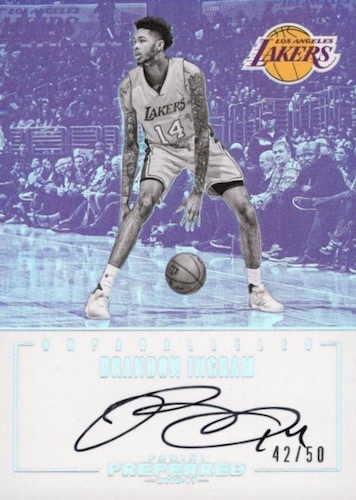 Shop current 2016-17 Preferred Basketball cards on eBay. PARALLEL CARDS: Prime #/25 or less (No Hardaway*). View Prime parallel numbering with the full spreadsheet. PARALLEL CARDS: Purple #/49 or less, Blue #/25 or #/15, Gold #/10, Platinum 1/1. PARALLEL CARDS: Purple #/49 or #/25, Blue #/25 or #/15, Gold #/10, Platinum 1/1. 99 cards. Serial numbered #/50. PARALLEL CARDS: Prime #/10 or less, Super Prime 1/1. 16 cards. Serial numbered #/99. PARALLEL CARDS: Prime #/10 (Drummond - 1/1*), Platinum 1/1. 14 cards. Serial numbered #/149. PARALLEL CARDS: Prime #/10 (No card #14*), Super Prime 1/1. 10 cards. Serial numbered #/149. PARALLEL CARDS: Prime #/10 (No card #3, #10*), Super Prime 1/1 (No card #4, #10*). Cards not in Prime parallel noted.*. 11 cards. Serial numbered #/149. PARALLEL CARDS: Prime #/10 (No card #1, #8, #12), Super Prime 1/1 (No card #1). 36 cards. Serial numbered #/75. 36 cards. Serial numbered #/99. PARALLEL CARDS: Prime #/10 (Ellenson - #/8), Super Prime 1/1 (No Ulis, Ellenson*). PARALLEL CARDS: Prime #/25 or less, Super Prime 1/1. PARALLEL CARDS: Prime #/25 (Card #8 - #/2), Super Prime 1/1. 18 cards. Serial numbered #/99. PARALLEL CARDS: Prime #/10 or less (No card #6*), Super Prime 1/1 (No cards #11, #13). I bought a box today listed as 4 cards per box at a local sports card shop. The price was &199.97 for the item. I was swayed by the appearance of it because it was only 4 cards guaranteed 2 autos and 2 memorabilia included. I was sorely disappointed when I opened it an realized that all 4 cards total value was just over $50.00. I understand that this is a random box but for all 4 cards to add up to about $55.00 in the current market is terrible. I would NOT recommend this product because it was a total loss to try. I would rather buy $200 worth of lotto tickets(I don’t even buy into any lottery) before investing or lack there of in this product. The two autos were Kay Felder and Larry Nance Jr. Really??? The only star was Demar Derozan but the card was worth $15.00 mint. Don’t buy it because the odds of getting one hit are not worth the price tag…otherwise happy collecting to all readers!